As I mentioned in the introduction, this game's main distinction is that it places you, not on a World War II submarine, but rather casts you in the role of a Russian defector in command of a Soviet sub. Another unique aspect is that the game is based on a best-selling novel of the same name, and despite all odds, still manages to avoid the curse that usually afflicts such adaptations. 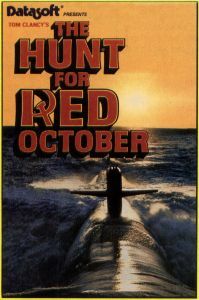 But aside from these slight differences, The Hunt For Red October performs pretty much like its counterparts. The wordy manual sets up the premise. You are a Russian submarine commander who has decided to defect. While your officers are aware of your intentions, the enlisted men know nothing, and further, must never be allowed to suspect your true plans. You have already killed your main enemy, a KGB agent who would certainly recognize your faked orders. Add to this plot a newly developed silent drive system that the Americans would love to add to their collection, and you end up with an exciting script that must be carefully adhered to in order to successfully complete the mission. In this respect the game more resembles a work of interactive fiction, in which your moves are carefully channeled toward a climax, than your usual simulation. The simulation begins immediately upon booting. There is only one scenario, with no variations of any sort, such as difficulty level or options, provided for. The screen, however, is designed logically, which speeds learning and allows for rapid input of commands during play. A map of the area occupies most of the display. A message area resides at the bottom while control areas and gauges line the left and right sides. Each control works the same way; clicking on a symbolic icon accesses a secondary command level from which the actual orders are issued. For instance, clicking on the engines allows the selection of nuclear or diesel power, caterpillar or propeller drive. Likewise, clicking on gauges such as the compass, allows direct input of commands. This is an intuitive interface, requiring little reference to the manual to play. And even if the booklet needs to be opened, its ample illustrations leave little doubt as to how the game is operated. This is another fine game, except for the lack of variety. I'm afraid that the single scenario, with no options or embellishments, yields a rather limited playing life. An annoyance was the way the game had to be restarted (by loading a saved initial file and selecting continue game). A simple new-game command would make game play easier.